Uncensored first-hand accounts: read them and find out what is really going on. Learn Scientology and get laid! They killed him with a thought - not! Pope Charles (SubGenius Pope of Houston and radio DJ) seems to be a natural born skeptic. Recently, he went off to sea and like L. Ron Hubbard, he assigned himself the rank of Commodore. Thanks to "Bob", he even stopped smoking. He also visited the Scientology bookstore and caused severe enturbulation! The girl who was too smart for Scientology - or was she ? Kim Baker was voted the best poster of alt.religion.scientology of 1994. She was a Scientologist when she started to post on a.r.s., but for some reason, OSA got pissed off by her remarks. When I started lurking, she made the post "I have been summonsed!". (sorry, I did not save those posts). Because of her doubt, she was temporarly excluded from Scientology services. But even after seeing how they "handled" her, she still wanted to go back, and temporarly did. free again! Her first post that she was out, this time for real. Part 1: Her first contact, the hidden agenda, why she was vulnerable to it, and some questions to think about. free again, an answer to OSA boy Buz Cory. Part 2: Her current depression, some thoughts about leaving a cult, and an explanation of the jargon of the Sea Org. Part 3: Her experience with the purification rundown, what went wrong, and some questions to think about. Kim's start on alt.clearing.technology, the newsgroup for the Free Zone. Part 4: Saving the planet (yes, really ! ), the student hat, the key to life course, deterioration of her marriage. Part 5: On staff: the technical training corps, the training routines. Summonsed again: Her best friend called to get her back in the cult - ouch, that hurts. Contains also some answers by her supporters and by the guy who was named worst poster of 1994. Part 6: Absorbed by the cult, her relationship with family and friends, living with contradictions, why stay in a racist cult ? Part 7: The darling of the cult, a lucky escape, leaving staff, and a lot of debts. Part 8: Being public again, the end of her marriage. Flashback: her discovery of a.r.s., how she was "handled" by OSA. Part 9: Flashback: being a Scientologist on a.r.s., a note about Dennis Erlich and her. Part 10: Flashback: more about her "handling" of Dennis Erlich. Then final break from the cult, fear of being attacked soon. Part 11: The conclusion about her experience in the cult. Her wins after leaving the cult - an anti-Scientologist success story ! Her ex-husband calls her on their wedding day, to hurt her a bit - nice guy, huh ? The end of her membership: She is now declared as a suppressive person, which means that she may be tricked, lied to or destroyed. How they manufacture hate in you: my favorite. A description of debate tactics designed to make people mad. These tactics are used not only by Scientologists. Your guide to handling OSA: my second favorite. A description of the Scientology techniques used in debate from the point of view of a Scientologist. The explanation did follow later. It was very long, and it later it came out that at that time, she had already betrayed the people who admired her and signed a lengthy declaration to the RTC, with some really amazing allegations. Reactions from the crowd were very mixed - some broke contact, some insulted her nastily, some almost broke into tears, some (Ron Newman for sure) kept the contact. My last message to a.r.s. Thanks to those (not me) who kept contact with her, she finally wrote a third affidavit, repudiating her statements of the first affidavit, but also made some general statements that should be considered. Most older posts from her do no longer have her e-mail address because she asked to have it removed. She came back later anyway. Here a list of her flip-flops. I met her in 1999 in Clearwater, FL. Here is her picket report. This is RICH!! The people that barbecued six million Jews have decided Scientology is not a religion. What's next, Heinz ? invite all the "non-state religion" members over for a little "SARIN-nade" ? I can just see you dropping the Zyklon-B crystals down the chute. They killed him with a thought - not ! Patrick J*** got his cult services for free, but didn't get results. After he asked too much questions, they threatened that they could kill him with a thought. Finally, a Scientologist started a fight on the street - read this if you want to know who won. Chris J.L. was a teenage Scientologist. He spent six months there, they even tried to make him drop out of school. They "handled" his mother, but not him ! He went out, and even got a refund. His story also explains the wacky world of "word clearing". Chris Lyman met a beautiful girl in his college years; but she was a Scientologist and kept talking about clearing the planet, instead of going forward with her life. He backed out before entering the Scientology world of paranoia. Ken Long considers himself as a Scientologist, and was several years on staff. He has produced a lot of high quality work, but didn't get from them what they promised him. His first critical post is about LRH's office at the Fort Harrison hotel. But he later said that he has made no public departure, and his beliefs and his kind of logic are still weird. Here's another attempt to resolve what he calls an "out-exchange" situation. Here is a summary of his work done, and what it is worth. Ken wonders if OSA does read a.r.s., and suggest them to pay up ! Here he compares the handling of his case to some California penal codes, and also to L. Ron Hubbard's technical dictionary. Then again, he explains why he is here and complains about double standards. To summarize, this is a good example that Scientology not only defrauds the public, but also its most dedicated members. Since Ken has not sued them, he'll never get any money. Arnaldo Lerma had joined Scientology at the age of 16 and became a Sea Org member who signed his standard 1,000,000,000 year contract. The contract did not allow him to get in love and marry Ron's daughter Suzette, so he had to leave. Years later, he started to post affidavits on America Online, which Scientology didn't like at all. The tactics they used against him were later covered by an article from the Washington Post, which was reprinted in other papers around the US. Months later, he posted affidavits from an open court document, and was raided by the cult, as part of their fight against free speech on the net. See pictures of the raid with the infamous Jim Settle going through his files. Arnie was sued by the cult, which wasted several millions of dollars in the effort. At the end, Arnie was fined $2500 only, and scientology was denied attorneys fees. Dennis Erlich was quite successful in the cult: he was Chief Cramming Officer (the german word is "Chef-Einpauker") in the Sea Org and knew Hubbard and Miscavige personally. He dropped out in 1982 as a result of Miscavige's take-over. For some time, he ran a newsletter for ex-members called The inFormer. He joined the internet in August 1994, and commented on the cult's papers. The result: the cult raided him, searched his house for six hours, deleted files on his hard disk, and sued him, as part of their activities against the 'net. He has not written a complete story, but here is his start, his his trip to the RPF's RPF, the attempts to reform scientology, his account of his departure after a power-struggle, and his depression before he knew that he was not alone. The St. Petersburg Times reported about his daughters Beth and Kristi in a long article about Scientology's children, and how they were abused by the cult. If you have RealVideo, you can watch the raid yourself (6MB). 24.2.1995 - "DNA code stolen!" 15.3.1995 - "With counsel to court"
12.7.1995 - "Saved from the Street"
18.2.1996 - "On the passing of my dad"
7.11.1996 - Dennis might go to jail: thanks to his wife who got some "help from her friends"
24.1.1997 - "Erlich - still at large": bad news for Scientology! 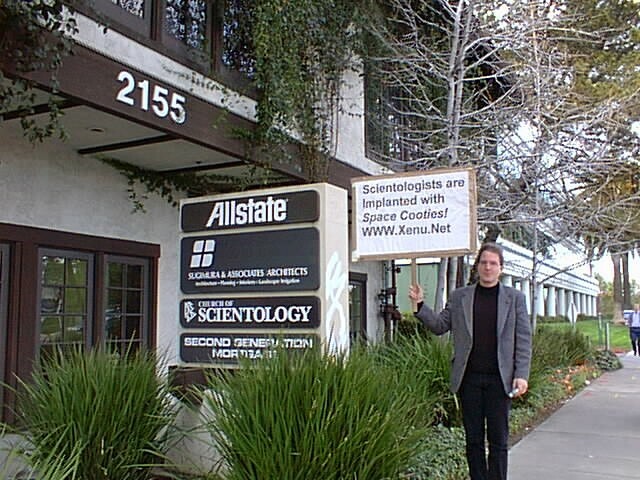 18.12.1998 - Scientology drops its claims for statuatory damages! 18.2.1999 - Declaration in opposition to motion to dismiss counterclaim: Scientology has often claimed that they took no action against him before the raid. This document shows that this is not true: scientology has harassed him since 1984. 23.4.1999 - The pretrial conference unseals some bad surprises for Scientology. Erlich had been the target of much black propaganda. Character assassinations routinely alleged that he is a wife-beater, a child molester, or has "a history of wife-beating". Here a document showing some contradictions. 1.5.1999: His settlement gets announced. Shortly after the settlement, all WWW pages from Scientology that attacked him were removed or altered to remove the libel and even his name. Even their black propaganda organ "Freedom Magazine" was altered, as was the "inofficial" site of Leisa Goodman and Parishioners.org. I'll never go for a deal like Netcom's where I can't talk about it. I'm sure the cult doesn't have enough money to get me to back off. or go for a gag. I had supported Dennis' litigation with several donations. The end has been a disappointment for me. In the future, my donations for litigation will come as a loan. This would have the advantage that when someone makes a deal with the cult, that I get my money back and can help the next litigant. Steve Solomon is a Scientology clear who has joined the newsgroup alt.clearing.technology. You don't understand anything from his story ? Don't blame yourself. Scientology can only be understood by Scientologists, and it works only in the Scientology world. "I don't believe in this so-called state of Clear, because it is ill-defined, hardly maintainable and subject to debate about what value Clear can give to any well-adjusted individual considering the Cof$ won't help if you are mentally unstable anyway". Harmon Leon from the Met (a Dallas' Arts and Entertainment Weekly) impersonated german musician Dieter Lietershvantz, who decided to go into the Scientology Celebrity Centre in Los Angeles. Here are Dieter's adventures. Isabel Hsin-Yu Chang was only a week in Scientology, and already wanted to drop out of college and get on staff for two and a half years ! But luckily, her family managed to tell her what Scientology was about, and she realized what a mess she had got herself into. Gordon Campbell's wife's family got sucked into the cult by a medical management company. The rest of the family got together to do something, Gordon did a lot of research work - until today without success. Julie Richard wrote a reader's comment on Bob Carrol's Skeptic's Dictionary about her experiences with Dianetics. Her letter shows that Scientologists she met were solely interested in recruiting more Scientologists, even if they had to use illegal financial manipulations. Roy Softley's mom met L. Ron Hubbard in post-war Britain. Her impression of him shows a precognition for things that were yet to come. Andrew Falzon went thru a Scientology "personality test", and found out that not only his personality is a mess, but also the personality of all his friends, and all the same way. Jim Lippard had a similar encounter, which finally led to a book review. Hud Nordin did not even start the test, because he managed to catch the recruiter with a lie. Karen Cutchin's friend had a different experience: her test was so good that they "persuaded" her to sign a 2 1/2 year contract. Reverend Doctor David Gerard of the Church of the SubGenius also went to his local org, made the test, and is now a member ! Learn Scientology and get laid ! Paul Landon is a Scientology version of Martin Tupper, the hero of the cable TV series Dream On. After doing some courses, he used it to meet girls - it worked ! A member of the MIT fraternity Pi Lambda Phi planned to drop out of college to sign a 1,000,000,000 year contract in joining the Sea Org (a cult inside the cult). Ron Newman posted a cry for help on the net, and the frat brothers got very active to help their member. Caring families and friends are a big threat for Scientology ! Troy Miranda left the cult in January 1995, because his wife and he were both tired of beeing penniless and getting nowhere in life. In his first message, he told that (unlike many other cult victims) his life improved considerably after leaving: new job, new house, better health. Amazing is that part of this improvement came by applying "Squirrel-Tech", i.e. Scientology-like material written by ex-members. (My personal opinion is that his improvement has other reasons, but if it worked, fine). I had not believed everything on a.r.s. but was finding out fast that they could definively be true. In a third message he clarified the role of a.r.s. and a.c.t. in his decision to leave the cult. Applied Scholastics is a Scientology front-group that propagates Hubbard study technology without telling about the Scientology link. Hubbard was so sure of himself that he thought that all his "inventions" could even work outside his wacky world. Study technology is based on the concept that all problems with studying are based on misunderstood words. Anyone who has studied something can tell that there is much more than just words to understand a text. L. Ron Hubbard himself flunked university (for some time, he had a doctor title from a degree mill), and current leader David "Damien" Miscavige did not even finish high school. Would you buy a car from a company where the CEO does not even drive ? Many people on a.r.s. including myself do believe that study technology is harmful for a good education, but could not bring evidence. Maggie Council forwarded us a first-hand testimony. Read also a more general discussion about Study Technology. Glen McClelland had exit-counseling at his parents' home. Scientology spreads a lot of rumors about sleep depravation, kidnapping and abuse - exactly what victims have always accused Scientology of doing. Glen tells us about Exit-Counseling at Tony's: they are giving their victims huge quantities of food, and allow them to sleep whenever they like ! Glen's dad is Tony McClelland from CultAware, Australia. Paul Grosswald had a very turbulent exit-counseling which apparently failed. But the team his parents had hired had already told him so much information, that the cult had no other choice than to release him. Paul Horne had already paid $200 for introductory auditing at the Celebrity Center in Hollywood, then changed his mind and wanted his money back, therefore being in disagreement with keeping the world free from insanity, crime and drugs - so they say. Ted Mayett dabbled in Scientology for about 15 years, on and off. When he requested a refund on $5,209 from the Celebrity Center Las Vegas, they played games with him, trying to trick him. He opened an internet account, and went wow! while reading all the information he didn't have before. The check is in the mail...Really ! Zane Thomas entered the cult as a teenager, and also left as a teenager, after having stayed about a year. There was some incredibly nasty stuff going on there, including imprisonment. It didn't take him too long to wise up and he left in December 1968, but had to recover his sleeping bag. In 1974, Laura Blanchard worked at Prevention Magazine. The magazine was concerned about its integrity, i.e. was aware that readers expected a high standard of advertisers. Laura's job was to handle reader complaints. One day she received a complaint about a Dianetics ad in the magazine. In order to make a decision, the magazine told her to order a copy, and to see what happened. From time to time, Scientologists "ask" Deirdre questions like "Where are the ten grand ?" or allege "You stole my money !". Of course they "forget" how the related confession came up: by extortion. Read this for the details. Peter Forde hadn't gone into the Sea Org completely blind: he was aware that he might get his thinking too far shut down, thus he made some guarding mental bear traps to catch Scientology out, and resolved to leave if any of these were triggered. The bear traps were triggered after five months. Peter is also known for the document "A Scientific Scrutiny of OT3", famous for its closely referenced geological scrutiny. In 1999 he told that he has also been a Moonie. For a long time it was a mystery on the internet what the actual OT8 really is, especially whether the OT8 from the Fishman affidavit were a forgery or not. In august 1996 Ariane Jackson, a swiss Scientologist, decided to speak out. Diary of a dying OT7: the diary of her ex-husband, who died having lost all his money by being defrauded by fellow Scientologists. Hans-Kaspar Rhyner: Another Patron Meritorious refusing to pay his debts. Read a translation of a newspaper article on Rhyner), and another mentioning that Hans Kaspar Rhyner has been convicted to two years and nine months in jail. He has left or been expelled of Scientology. According to Michael Pattinson, the "end phenomenon" of OT8 is now I know who I am not, and am interested in finding out who I am. Peter Mousiol was "bored" of his printing company in 1988. One day he ordered a book from Les Dane for a staff member, which resulted in his entry in Scientology. In 1992, he had lost several millions to Scientology and to Scientologists because he was a very naive person. He then wrote a Knowledge Report which was leaked to the internet a few years later. Maria Pia Gardini got into Scientology through her daughter. Read how Scientology squeezed over one million dollars out of her. Steve Keller, a longtime friend of Bob Penny (of FACTNet fame), lost his daughter Amanda to Scientology, as his ex-wife took her with her after she divorced him, and then moved her around the country. In a last desperate move, he put up a web site in her memory. The communication skills of Scientologists exist mostly in their own mind. So sometimes it is useful to hold people captive until they sign. The experience of Dee Rowe and Glover Rowe was told in a newspaper; same for Dorothy and Robert Geary (read also the declaration of Robert Geary); the experience of Lin M was told to me in e-mail. It gets worse: Roxanne Friend was kidnapped, drugged and imprisoned. Scientologist OT8 Painter Michael Pattinson was held against his will on the "Freewinds" ship (passport was withheld) and also in Clearwater, in both cases to extort money from him. Marianne Coenan was locked up by her family and submitted to the Introspection Rundown. The article The Prisoners of Saint Hill described lock-ups in the UK. Frank Notaro picketed the Advanced Organization in Los Angeles (AOLA) to ask for a refund, and was kidnapped and locked up for an hour (read a transcript). A paraglider who landed within the Scientology compound near Hemet was threatened with semi-automatic weapons and locked in a box overnight. Thanks to "religious freedom" and enough money, nobody has been indicted. This might change with the case of Lisa McPherson, who died in isolation. Kristi Watcher has collected more examples of false inprisonment by Scientology. Kathryn (not her real name) wanted to quit scientology after getting doubts. Thanks to scientology "counselling", she got mentally ill and received a prescription of Chloral Hydrate by scientologist doctor Megan Shields. OSA successfully prevented what she really needed - psychiatric help. The result was that she got even worse, until she landed in an emergency room and stopped taking the medication. After that OSA pressured her to sign an affidavit that everything was fine, etc. To top all this, her auditing folders were "cleaned" of incriminating evidence. Unlike Lisa McPherson, Kathryn got out alive. The guy with whom Natascha fell in love was a Scientologist. Natascha did follow his advice to "find out for yourself", and did not like at all what she saw. The guy with whom Ilse Hruby fell in love and married was a Scientologist, and his membership was more important to him than his family. In her interview, she describes that she felt that she was actually married to 35 people (you can also read the interview in german or order her book or read it online in german or in english or visit her german homepage).